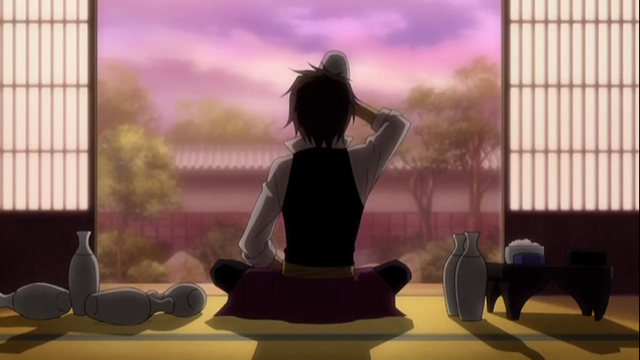 Heisuke pounds a few bottles. 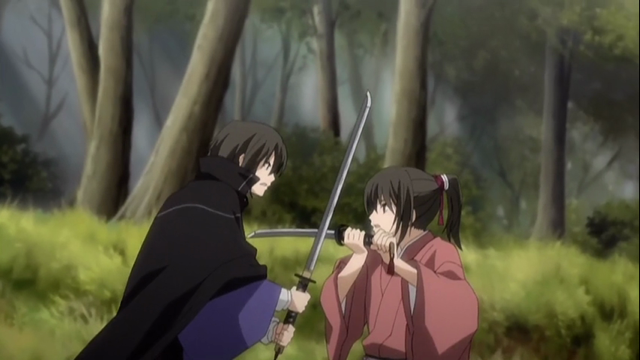 Hakuouki episode 15 (Hakuouki Hekketsu-Roku) principally covers the Shinsengumi escape from the Rasetsu warriors created by Koudou, and Chizuru’s further discoveries about the secrets of the Yukimura clan. We also say good-bye to more Shinsengumi members. I can't believe my little sister is this cute. 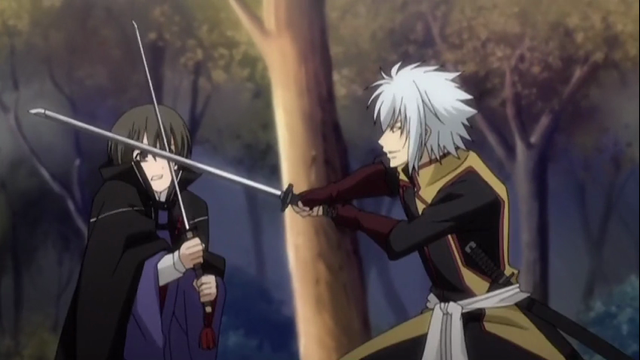 Wonder of wonders, Chizuru participates in a real sword fight. Kaoru informs her that he is her brother, and explains that he is working with the man she thought was her father to develop a Rasetsu army to destroy mankind. When Chizuru refuses to leave her post guarding Isami Kondou, Kaoru attacks her. She does fight back, but Kaoru gets the better of her. Kaoru doesn't look too happy. Souji Okita appears, and saves Chizuru and Kondou for a time, but his tuberculosis kicks in and Kaoru tries to take advantage of the situation, only to be killed by an unexpected ally. 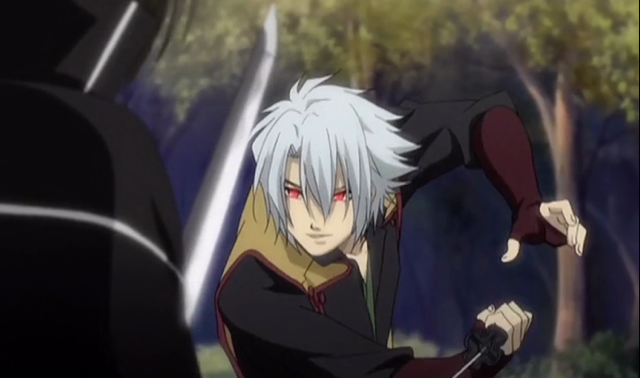 Kondou helps bury Kaoru. Even though Kondou and Hijikata are acquiring new recruits, Sannosuke Harada and Shinpachi Nagakura decide it is time to leave the force. Chizuru wants to try to convince her uncle (the man she still thinks of as her dad), to give up on his plan of destroying mankind with his demon army. In my experience, that’s the sort of thing that is hard to talk people out of. It wasn’t as great an episode as the previous one, but I’m glad to see Chizuru still showing resolve. The way how Chizuru felt towards Kaoru when he was dying did felt weird to some people because all she did was shed a few tears and got over it quickly, making it look like she didn’t care for her brother that much. I feel like I’m the only one thought she truly did care (from the time they spent together). When she found out Kaoru was her brother, she still add suffix to his name. When he was dying, she DID NOT use suffix. She just called him Kaoru. It’s sad that Sano and Shinpachi are leaving for good, but at least they’ll appear again. It would be hard to go from not knowing you had a brother to truly grieving over him. Especially when he was trying to kill your friends. Given that, she did show some remorse that he died, but she was mentally prepared to kill him to save her friends, so not as much as if she had known him her whole life.